I was the new boy, so they saddled me with the worst jobs. Rome, AD 71. Against his better judgement, Falco secretly disposes of a decayed corpse for the Emperor Vespasian, then heads for the beautiful Bay of Naples with his best friend Petronius. He conveniently forgets to mention to his companion that this will be no holiday. They have been sent to investigate the murderous members of a failed coup, now sunning themselves in luxurious villas and on fancy yachts. The idyllic seaside location further complicates his seemingly doomed romance with Helena Justina. The deeper he probes, the more it seems Helena is inextricably connected to the elite plotters, in ways that the smitten Falco cannot bear to contemplate. Nothing deep here, no moral challenges, no philosophical questions. Just plain fun, with entertaining characters and a decent, though not outstanding, performance. I still like the Medicus series better, but what can you do? Life is full of compromises. One quibble on the historical accuracy. Falco refers to someone as being syphilitic (maybe even more than once), but that disease did not yet make it to Rome. Once I notice one inaccuracy, as inconsequential as it is to the story, I wonder about others. good story, performed by pensioner! What did you like best about Shadows in Bronze? What did you like least? this follow up story from 'The Silver Pigs' is wonderful, but the narration is now taken over by a man who is obviously elderly and has a trick of tailing off his sentences which robs the narrative of any excitement. CHANGE THE NARRATOR FOR SOMEONE WHO SOUNDS YOUNG! 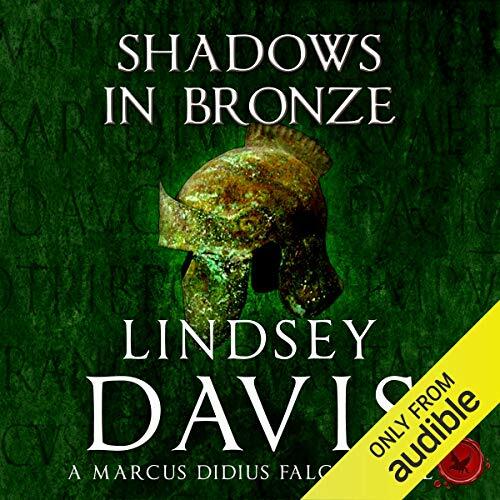 Do you think Shadows in Bronze needs a follow-up book? Why or why not? it's already got a whole library of follow ups. just change the narrator. Gordon Griffin sounds like a nice guy, but his narration robs the story of any emotion. Enjoyed the story but prefer Christian Rodska as narrator - he sounded more realistic. Will definitely read more by this author. The narrator is not a patch on the original. A lot of the dry humour is lost in this book from stilted narration. The main personality of the main character seems lost on Gordon Griffin. It is still a good story, and the characters are very well written. Might read, rather than listen to the next instalment. Not Falco with this narrator. Couldn't cope with the change of narrator from the impeccable Christian Rodska. Dull and lacking character after his cheeky verve in Silver Pigs. Returned to Audible. Will have to continue my binge reread on paper till I get to where Rodska takes over again. Would you listen to Shadows in Bronze again? Why? I enjoyed the story - the quirks of Falco's character voice and the vividly real people and places he encounters. I missed Christian Rodska so much, though. He was the perfect voice of Falco in the first volume. Characterization; sense of time and place. What three words best describe Gordon Griffin’s performance? Yes, but it would be a spoiler to say who gets hurt. I did like Falco's care of the less fortunate - his seemingly endless family, and especially the sacred goat. If Lindsey has any input on the choice of narrator, please, I beg her to insist on Christian Rodska. Falco is an idiot without a good woman in his life. Laugh cry and annoy at times. I know Lindsey has gone on to write books about Falco's daughter, but you can't beat Falco.